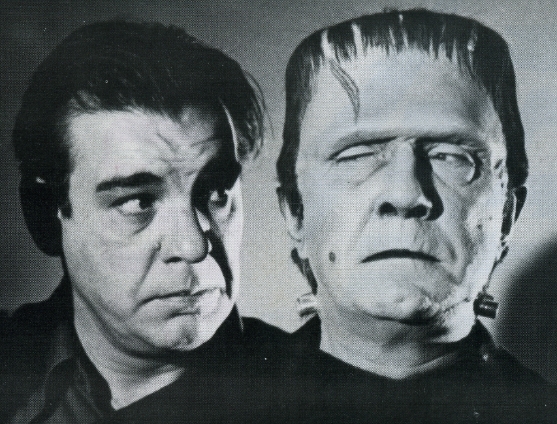 Frankensteinia: The Frankenstein Blog: The Monster : Lon Chaney, Jr. The Monster : Lon Chaney, Jr.
On this date, February 10, in 1906, was born Creighton Tull Chaney. He would be known to the world as Lon Chaney, Jr.
Creighton’s parents were vaudevillians. His mother, Cleva Creighton, was described in contemporary newspapers as a “dainty singing soubrette” and a “ragtime singer”. His father, Lon Chaney, was then a struggling actor. When Creighton was born, Lon was also moonlighting as a rug salesman. Times were hard, and the worst was to come. In April of 1913, following an argument, Cleva made a botched suicide attempt in a theater where Lon worked as stage manager. The event was over-dramatized in the Lon Chaney biopic of 1957, Man of a Thousand Faces, placing James Cagney as Chaney onstage, in a clown costume, with Cleva swigging poison while standing a few feet away in the wings. Cleva survived but her singing voice was destroyed, and her career with it. The Chaneys divorced and young Creighton was shipped off to a foster home. He returned to his father’s side in 1915 after Lon remarried. Cleva was never mentioned again and it wasn’t until Lon’s death in 1930 that Creighton learned that his mother was still alive. Lon Chaney raised his son on the straight and narrow. His grim experiences on the road to stardom made him adamantly opposed to Creighton’s natural inclination to follow his footsteps into show business and motion pictures. In the 30s, now on his own, Creighton attempted to forge a film career for himself under his given name. He would be relegated mostly to small parts, often uncredited. Genre fans note his appearance as a burly guard in a futuristic gladiator skirt in the energetic 1936 serial Undersea Kingdom. Creighton would always claim that it was the studios that insisted he call himself Lon Junior, after his celebrated father. In 1939, Chaney Jr. gave a searing performance as Lennie in Lewis Milestone’s film of John Steinbeck’s Of Mice and Men, but all the acclaim failed to translate into a high profile film career. His real break came in 1941 with the sleeper hit Man Made Monster, a Universal B-movie in which mad scientist Lionel Atwill transforms Chaney’s good guy character into a reluctant electrical-powered killer, his head lit up like a lightbulb. At the time, Universal’s second wave of horror films was just getting underway. The monsters of the golden age were being set up for sequelization. The missing ingredient for box office stability was a genre star, a name to associate with the new chillers. Veterans Boris Karloff and Bela Lugosi had moved on, Karloff to new challenges and increasing diversification, Lugosi to discount stardom in Hollywood Poverty Row potboilers. With Man Made Monster, Universal found its new herald, an eager young actor with a loaded name: Lon Chaney, Jr.
Chaney would essay all the key characters of Universal’s horror stable, including Dracula and The Mummy, whether they suited his All-American bulk or not. He was the first actor to step into Boris Karloff’s Frankenstein’s Monster boots, marking a transition of the creature into a towering robot in The Ghost of Frankenstein (1942). Universal also cast him in the Twilight Zone-type series of Inner Sanctum mysteries. Chaney made one original part his own: The Wolf Man, first in an elegantly mounted feature that was a box office hit even as America headed into World War Two. As an immediate sequel to The Wolf Man, Universal announced that Chaney would play both monsters in a momentous clash entitled Frankenstein Meets The Wolf Man, but cooler heads prevailed — there was no reason or advantage to make expensive split-screen effects for an actor playing two parts under heavy makeup disguise — and the Monster’s role fell to a frail Bela Lugosi, with Chaney carrying the picture as the cursed werewolf, Larry Talbot. In real life, Chaney was a boisterous, outdoors type, much like the unsophisticated heroes he played. His good-humored if outrageous practical jokes, fueled by heavy drinking, led to constant tension with his frequent leading leady, scream queen Evelyn Ankers, and probably marked him as an unreliable commodity. After the Universal horror cycle ended in the late 40’s, Chaney stayed busy, but only in secondary roles, where he often excelled. He was very funny as a Lennie-type to Bob Hope in My Favorite Brunette (1947), and he played small but striking parts in High Noon (1952) and The Defiant Ones (1958). He also turned in some significant work as a guest on a number of early TV dramas. Chaney’s relationship with the Frankenstein Monster continued beyond his performance as the title creature in Ghost of Frankenstein and battling Bela Lugosi’s Monster in Frankenstein Meets The Wolf Man. As the lycanthropic Larry Talbot, Chaney shared the screen with The Monster in House of Frankenstein (1944), House of Dracula (1945), and the excellent Abbott and Costello Meet Frankenstein (1948). In that last one, Chaney gamely donned the flattop Universal Frankenstein Monster makeup for a brief, uncredited scene, stepping in for Glenn Strange who had cracked an ankle with a stunt gone bad. Chaney also slipped on a Frankenstein rubber mask and danced along with Abbott and Costello for a skit on their TV show in the early 50’s. In 1952, Chaney played a bald-headed Frankenstein Monster in the notorious live broadcast adaptation for TV’s Tales of Tomorrow. I posted a detailed review of that one here. 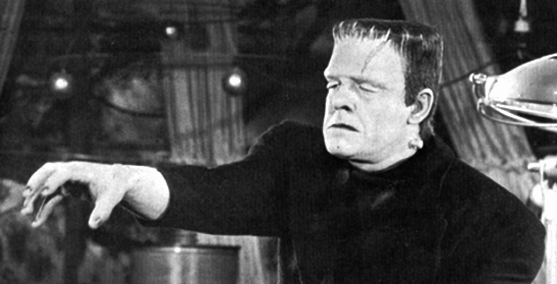 Ten years later, Chaney played himself on a celebrated episode of Route 66, appearing as both Mummy and Wolfman opposite fellow fright stars Peter Lorre, and Boris Karloff in Frankenstein makeup. Lon Chaney, Jr. is remembered fondly by movie fans. He dominated the 40’s horror cycle, an unlikely leading man, better suited to playing rugged character parts. He always gave an honest performance, and he was genuinely proud of his signature role as the movies’ pre-eminent Wolfman. Lon Chaney, Jr. died in 1973 after a long illness. He donated his body to medical research. Biographical information gleaned from Michael F. Blake’s Lon Chaney: The Man Behind the Thousand Faces (Vestal Press, 1990). Posters courtesy of Jean-Claude Michel. 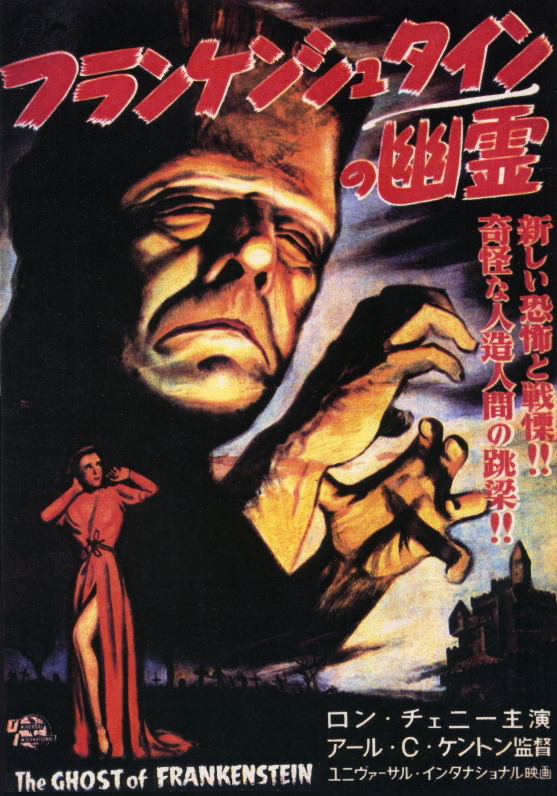 Universal Frankenstein films available through the Frankenstore. Lon Chaney, Jr.’s IMDB page. as a kid, i really tapped into Lon's tortured Larry Talbot when they would run the UNiversal movies on a local UHF channel. he seemed to have a pretty difficult life, which is too bad. and its also too bad he didn't live to see the absolute adoration a whole new generation of film/horror fans have for him now. imagine the love he'd get going to a convention nowadays! He always seemed a sad figure to me, forever in his father's shadow, never quite attaining the same level of fame. Chaney's Byronic interpretation of Larry Talbot was a huge influence on the genre. I too wish he'd lived to receive his due the way Karloff did. You forgot to mention his last Frankenstein-related role in the awful DARACULA VS. FRANKENSTEIN. that movie makes me sad, seeing Lon like that--drunken, bloated, and mute, used only as a name on the poster. makes Bela's roles in Wood's movies look good in comparison. Good catch, Anonymous. Yeah, Dracula vs Frankenstein is sad spectacle. When you think about it, Karloff’s career got a bounce from the Monster Boom, Shock Theater and Famous Monsters and all that. He was active through the 60s. Chaney was younger, he could have enjoyed a second career, but his health was shot. So sad. Frankerstein looks exactly equal than coworker of mine. He has the same hair cut, and actually he is a few green.